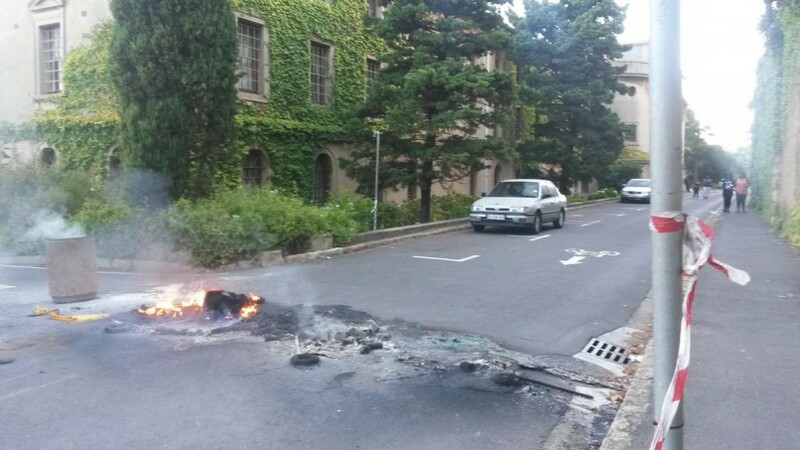 Angry students at the University of Cape Town allegedly petrol bombed the Vice Chancellor’s office last night. The University’s student Representative Council President Rorisang Moseli confirmed the incident saying student might have been angered by the management to remove the shack they had erected on campus on Monday morning. However, Moseli said it was unclear to determine how students could have went through the offices as the university had employed private security on campus to guard against any violence. The violent protests erupted last night over a shortage of student accommodation. Firefighters extinguish a Jammie Shuttle that was torched by protesting #RhodesMustFall students. Vice Chancellor Max Price’s office was left targeted during the violent protest. University of Cape Town (UCT) Vice-Chancellor Max Price says his office was targeted and petrol . A Jammie Shuttle bus and a bakkie were also torched. Police confirmed that eight people were arrested at the university last night and are expected to appear in court today on charges of public violence and malicious damage to property. Police were called in and used stun grenades to disperse protesting students who are up-in-arms over a shortage of student accommodation. Moseli said the university have beefed up security on campus. This week, student swore they would not stop the protest until the shortage of accommodation was address, student leaders and the RMF also promised to spread the protest to other universities around the country if government and higher education authorities did not help.